A Finnish investigation revealed that crew actions following a mechanical failure caused an ATR-72 passenger plane to veer off the runway at Helsinki, Finland. On August 19, 2012 a serious incident occurred at Helsinki-Vantaa Airport when an ATR 72-212A, registration OH-ATH, operated by Flybe Finland, veered off runway 22L. It was on scheduled flight from Tampere. There were 27 passengers and four crew members on board. As the aircraft was approaching Helsinki-Vantaa Airport the automatic functioning of the Travel Limitation Unit (TLU), which limits rudder deflection, malfunctioned and the flight crew did not switch on the TLU’s standby system. Since the normal landing criteria provided by the Quick Reference Handbook (QRH) for a TLU FAIL situation were met the captain decided to continue the approach and land on runway 22L. Upon touchdown the captain noticed that the rudder pedals felt as if they were stuck. Since rudder authority was unavailable, the aircraft veered off the runway onto the shoulder strip during the landing roll. The captain, using nose wheel steering, managed to steer the aircraft back onto the runway. 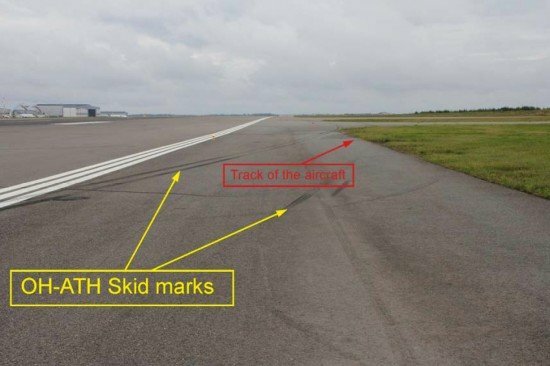 The serious incident was caused by the mechanically centred rudder’s insufficient authority for directional control which resulted in the aircraft veering off the runway. A contributing factor to the serious incident was that the electric motor of the TLU’s actuator broke and the TLU remained in the high speed (HI SPD) mode for the approach and landing, thereby jamming the rudder. Another contributing factor was that the flight crew did not switch on the TLU’s standby system. This was due to their inadequate system awareness and lack of clarity in Quick Reference Handbook (QRH) instructions with regard to using the standby system during a TLU failure. Yet another contributing factor was the asymmetrical propeller blade angle transition into the BETA zone following the reduction of engine power at landing, which resulted in a strong sideways oscillation. Safety Investigation Authority, Finland issued four safety recommendations to ATR, the aircraft manufacturer. They pertain to the more detailed instructions concerning the operation of the ATR’s Travel Limitation Unit (TLU).